Custom bus signs, available through UWG Publications and Printing, can be displayed on campus shuttles as a remarkably effective way to convey your message to a growing number of campus commuters. Nine campus shuttle buses run weekday routes on the inside and outside campus perimeters, to stadium parking, and to area apartment complexes. Each bus offers inside tracks for signage above both rows of seats. Official University of West Georgia internal units. These include colleges, departments, centers or affiliates. Officially registered student organizations. The Center for Student Involvement must pre-approve advertisements and announcements from student groups. Non-affiliated organizations, as approved by the Executive Director for Auxiliary Services. Non-affiliated organizations may purchase advertising by contacting the Auxiliary Services Department at 678-839-6525. Nine campus shuttle buses run weekday routes on the inside and outside campus perimeters, to stadium parking, and to area apartment complexes. Each bus offers inside tracks for signage above both rows of seats. The five smaller buses can accommodate eight custom signs each, and the four larger buses have space for up to 14 custom signs. This means the shuttle fleet has room for a total of 96 custom announcements and advertisements each week, in addition to the two spaces allocated at the front for shuttle information. Spaces are assigned on a first-come basis. A full set of shuttle bus signs for your department or organization generally includes 18 signs, two per bus, the maximum permitted per event or campaign. Signs are displayed for two weeks. However, during times of heavy usage duplicate signs on a bus may be removed to accommodate all requestors. Permission can be given for additional signs and extended display time for special events or programs, when space is available. 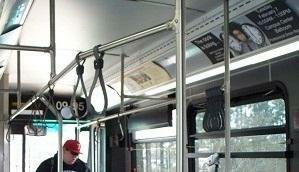 Bus signs are horizontal, must measure exactly 11” in height, and may be no longer than 41” wide. Design and content is managed by University Communications and Marketing. All content will follow the university’s “Visual Identity and Licensing Guidelines,” including the appropriate UWG logos and trademarks. Contact UCM to begin the process of developing your signs. You may provide your data to UCM for professional design services, or present your design concept for approval. UCM will be happy to provide your approved design file to Publications and Printing for production. Designs must conform to brand identity guidelines and meet graphic and editorial standards. While your sign order is being designed or approved, UCM will advise you to place your order with Publications & Printing. Please provide the number of signs you are ordering and your account number for charge back purposes. Production will begin after you have provided your order information to P&P, and UCM has provided your approved design file. 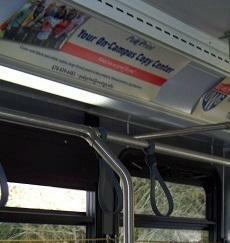 UWG UNITS: Shuttle bus signs cost $22 each. A full set of 18 costs $396.00. Costs will be automatically charged to your campus department or student organization. Self pay is by cash, check, or Wolf Bucks. 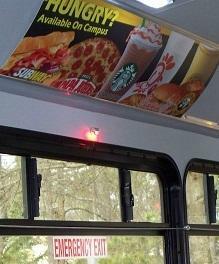 Your On-Campus Copy Center will print your signs on material suitable for mounting within the display tracks located above the seats on both sides of the buses. Please allow 4 to 5 working days for production. While signs are always generated in a timely fashion, this popular service is often in high demand and production will be on a first-come basis. Parking and Transportation Services Supervisor Wade Crenshaw coordinates placement and installation of signs. The shuttle service is provided by the Parking and Transportation Office under the Associate Director of Auxiliary Services Ely Elefante. The office of Auxiliary Services reserves the right to remove advertisements at any time. Final authority for sign display and policy rests with the Associate Vice President Mark Reeves. Upon removal, signs are available for pickup from the Parking Office located in Row Hall. Signs not picked up within 5 business days after removal may be discarded. Parking and Transportation does not guarantee the return of your signs.